This is probably our most favorite page here at the Land of PureGold. Much work goes into a site such as this, given that materials and information on caring for our furry family members is constantly evolving. So, when someone takes the time to express positive feedback, it lifts the spirit and boosts our determination to continue. Please enjoy the following testimonials to understand how so many new Golden friendships have developed over the years. I just had to write to you to say "thank you SO much" for such a comprehensive, informative, innovative website. This should most definitely be mandatory reading for pet "parents" & prospective "parents" of Goldens (such as myself) as well as all breeds. After reading just a bit of the information (as time constraints allowed), I will only buy organic bedding, toys, etc, and will take comfort in knowing I am promoting the health and longevity of a cherished best friend. My beloved, ADORED yellow lab, Michael, succumbed to retrobulbar cancer 3 weeks shy of his 14th birthday. Perhaps a long lifespan to some, but to those of us fortunate enough to share our lives with these incredible souls, never long enough. Mikey's environment was always kept as "natural" as possible, without pesticides on a lawn, chemical flea/tick preps. on his skin, etc. He was given Vitamin C as an antioxidant from a very young age. I am so grateful to now have a wonderful resource to refer to for an even greater investment in health and longevity. I came across your website when looking for unique and special items to honor Dexter's life. I had no idea that I'd receive such personal service. You've been so kind, and your messages so thoughtful and comforting. Thank you. I'm going to share my experience with friends and family, and highly recommend they visit your website. Many thanks. I am a certified professional dog trainer and certified dog behavior consultant with over 35 years of experience in training dogs. I have been a shelter dog evaluator for over 30 years and I am currently helping people hand pick and train their own service dogs. I would like to ask permission to link your site to my site as an educational link for service dog information. I have viewed quite a few sites and yours is by far the most informative for those who are interested in training their own service dogs. I recently stumbled on to your website because someone sent me a link concerning a photo contest that you are running...I halfheartedly clicked on it, but then found myself consumed for a good 2 hours browsing your entire site! I am a positive reinforcement trainer in Michigan that works with a wide range of dogs, from typical obedience classes, rescue dogs, abused dogs - including neglect, physical and emotional abuse, dog or human aggression - SAR dogs, therapy dogs. I think you get the picture: I work with all kinds of dogs on a daily basis. I am blessed enough to be one of the few people on earth that can actually say I\'m living my passion. I wanted to let you know that your website if phenomenal! You have so much important information that I could spend another 2 hours and probably not cover it all. I am very hesitant about the websites that I refer clients to, but this one is a website I will gladly point them to! Just thought you should know. Wow! Your newsletter is wonderful and uplifting. I feel so fortunate to have found your site. You have definitely filled a void with your Foundation. I can tell you, whenever possible I am your sites biggest cheerleader. Whether it is solicited or not, I am always encouraging pet owners to buy the healthiest food, and treats, and that you are the best place to go. I just had to write and thank you for getting me through the last 10 months and even before that by reading your site everyday, being in the same disabled situation as you and my Golden obsession, and your daily quotes have been lifesavers. But I received a miracle today with my Bailey that I had to share with everyone. She was diagnosed with osteosarcoma last October at age 11 and my world fell apart. My vet told me she would not suggest amputation at her age, just go home and love her for the time she has left. That was not acceptable to me, so I called a good friend of ours who is a veterinary surgeon in Phoenix, and told him her diagnosis. He said we needed to get her leg off immediately. I read everything on osteosarcoma I could get my hands on and scheduled surgery for the next day. He removed her right rear leg. It tore my heart out to see her after the surgery, but the report came back it was osteosarcoma so I knew we had done the right thing. We had already decided we did not want to put her through any other treatments because she is my Velcro dog and I just knew she would not handle it well. We were ready to love and cherish her for whatever time we had left with her. Our surgeon also told us her time was limited, but she was out of pain with the leg off. Long story short, every day since then has been like waiting for the ball to drop. We had a huge 12th birthday party for her, thinking this would be her last. By today, we were wondering why she wasn't getting sicker. She is still eating, loving her car rides, still being the same Bailey, just slower getting around. We made the excruciating decision to take her into the surgeon today to have a chest x-ray done to see where she was at. After the longest ten minutes of our life, he came in and told us she has no mets in her lungs. She is in the 1% who survive! Well, we cried and couldn't believe the miracle we had just been given. Our surgeon said she is one very lucky dog. My point in writing this is every day since her diagnosis, I would think about you losing Darcy, and I kept telling my husband I don't think I will ever get through losing Bailey. She is such a part of me. I know that day will still come sometime, but I wanted to let people know to not give up hope until you absolutely have to. I sent a picture of her into the gardener's contest laying in the flowers in my yard, and that is Bailey. I knew she wouldn't leave me yet. Who would I have to garden with? Okay, I'm crying now, so I'll stop. Just thank you for creating this wonderful site where I can go everyday and feel a kinship. I don't know how you do it, while also dealing with the ups and downs of having a disability. G-d bless you and your family for it. Oh Rochelle, your article brought tears to my eyes. I am SO TOUCHED! Thank you on behalf of all retiring Military Working Dogs who have no voice but ours! I will forever be grateful. SEMPER FIDO! Tomorrow marks the second anniversary of the passing of our beloved golden retriever Maggie. We knew the end was near and I remember going to your website for advice on saying goodbye. It is then that I saw your beautiful tribute to Darcy. I felt and still feel a connection with you. You were able to put into words exactly how I was feeling and the photos of Darcy reminded me so much of Maggie and all the joy she brought into our lives. I still miss her more than words can say and I know you feel the same way about Darcy. Your tribute “Amid the Falling Snow” was very apropos for me too as it was snowing the day before Maggie died. She loved the snow and even though her body was failing rapidly, she felt invigorated when we took her outside so she could feel the snow flakes on her face. I’d like to thank you Rochelle, for all the time, effort and love you put into the Land of PureGold. It has helped me in so many ways. I can only imagine how difficult it must have been for you to write the tribute to Darcy. It's a beautiful tribute to a wonderful dog and I thank you for sharing it. Rochelle, you do such a wonderful job on your website. I enjoy looking at the videos and information you put on there. Freebo, I just loved his song for Garbo. I hope I have a few more years with my boys. Bud is 11 and Max is 9 they are father and son. My Goldens are my life. Keep up what you are doing your website is GReat! Thank you so much for all your hard work and dedication. I just viewed your latest youtube video and it was soooooo cute. Also, I appreciate you posting the Nightline report on Golden Hunter. I set my dvr to record the program but for some reason it only recorded the second half. I was very upset that I missed it. Our first golden, Brandy had severe hip dysplasia and our present golden, Darcy is having problems with a torn Anterior cruciate ligament. She had surgery in August to repair it and was doing good until a few weeks ago. Now she is having some problems again. This information may help her. I know you don't hear it enough but your efforts are appreciated. Thank you! Thank you! Thank you! In April of 2000 our first golden Brandy died suddenly. We had taken her to the vet and she had decided to hospitalize her for tests. The second day she called and told us that Brandy had a seizure and died. We were devastated and I felt so guilty that she had died alone. I started looking on the internet for consolation and found Land of PureGold. Your site helped me a great deal and there I met your Darcy. She was such a beautiful golden and I absolutely loved the name. We decided we had to have another golden and I started researching breeders in our area. We decided on a breeder and she had a litter that had just been born, one day after Brandy had died. It seemed like fate. We went to see the pups when they were five weeks old and met our girl. She climbed out of the bed and came right over to us. It was love at first sight. Over the next few weeks we tossed around several name but I kept coming back to Darcy. We brought her home when she was seven weeks old. I hope you don't mind that we borrowed the name from your Darcy. Hi from the Arizona Golden Retriever Connection in Phoenix. I am the webmaster of www.azgrc.org. I was very impressed with your Taking a Bite out of Cancer mnemonic – it is timeless. I would like to ask your permission to display it on our Health and Education page (giving you full credit of course) and to make handouts available at our adoption events. So many of our rescued dogs succumb to this disease and making more information available might help prevent or cure someone’s beloved pet. I enjoy all your topics and I passed along the treating dogs with their own stem cells for hip dysplasia to our members since many Goldens possess this affliction. Hope to see more information on this become available. Thanks for all the information on your wonderful website. You set the standard for other rescues to follow. Your website has changed my life, literally. It's so wonderful to visit, and never run out of things to read and see. The effective way you demonstrate the canine-human bond gives me hope more people will finally understand. I am a Golden owner from Stockholm, Sweden. I wish to thank you for this precious site of yours that helped me a lot when I groomed our Golden Rufus. His mom is a Labrador retriever and his father a handsome Golden retriever. He is 3½ years old. Your website is marvelous. Thank you again. Rochelle, the page is beautiful. This morning I pulled it up at work, and I wish you could have seen the the moment. Sixty-some odd employees of Transplant Services at the hospital I work at, all in tears (including one of the crusty surgeons). Animals have an amazing ability to allow us all to let down our guard – something we often find impossible to do with our fellow humans. This is a very hard week, but it truly does help to be able to write something, and share it with others. What you do on your website is extremely important, and I thank you from the depths of my heart. You have a wonderful organization and a wonderful, informational website. Thank you so much for getting right back to me and for your encouraging words about Dr. Wen. I do feel confident in this approach and I would hope I have the courage of my own convictions to consider very strongly as a first option holistic care for myself, as I am not sure the balance of quality of life issues versus treating the disease at all costs always makes sense and it may not be the best course that we're always being sold by the system. In reading the story of Gus and the obvious strong emotional bond of love between Mary Jane and her beloved Gus and the emotional rollercoaster of dealing with his health issues, I know it must have been a devastating loss for her and her family. He obviously was a beautiful, gentle soul. It is truly devastating to lose them. So important to celebrate each day we have with those we love, isn't it? That's all we can do in this life. I can only imagine how many lives were saved and turned around because of this organization's dedication, both by educating people and having turned around the lives of so many deserving animals themselves. You are making an incredible difference in this life and a truly purposeful, meaningful life it is. I'm definitely a fan. I love this website! I read it often when I am feeling sad due to the loss of my golden, Sadie to cancer last year. The story, The Long Goodbye, is the most touching story I have ever read. I can relate to his feelings about the loss of his dear friend. After Sadie died, I found the APLB. What an amazing group! I found care and compassion when I truly needed it. Thank you for all that you do. Each time I read your stories about your goldens, Darcy, Alfie and Ollie, I cry. There is nothing that compares to the love of a golden. You are a true golden lover and an inspiration. I just got back from a 10 day deployment (over Memorial day of course) to find this great slide show you put together. That is a great presentation. Thanks for not forgetting about those who serve. It's tough sometimes when you are on the other side of the world in a foreign country, so to see that the community that I've chosen to be a part of, goes out of their way to remember those who serve, warms my heart. Thank you. I have to tell you that I forwarded your site to my 73 year old mother and she spent an hour looking at everything. She loved it! She even figured out how to send me an ecard―I hadn't even figured that out yet. Your site is amazing. I am so proud to be associated with the Land of PureGold. I have sent many of my friends your site and they so enjoy it. I have found that sometimes the only responses you receive are complaints. That is why I always try to commend someone when they go the "extra mile". I think you are going the "extra mile". It is such a busy world. We all need to take more time to "hug our Goldens" instead of smelling the flowers. Thank you so much for the site and please keep up the good work. And if I forget to write to tell you thank you, send me a pinch. I must be the "handful plus one" who visit your blog! I love it! And I share it with other golden lovers (and dog lovers) I know. You're doing a wonderful thing by posting golden stories -- it just makes my day when I check in and there are new things posted that make me smile or touch my heart. I especially loved the "oldies but goodies" stories posted last week -- about the 19-year-olds, 17- year-old, etc. We have a 14-year-old at home who is basically healthy according to the vet. We're hoping she sticks around that long! Keep up the good work and everything that you do for this wonderful breed! Rochelle, thanks you for your wonderful web site. I found you last Thursday evening, searching the web for answers. My wonderful 11-year-old Duke was diagnosed with cancer last Thursday afternoon, and our life has been, well, I cannot find the words to say what we are feeling. His sister, Sammie, is now showing how upset she is as well. I have found myself coming back to your site at all hours of the day and night. I cry, smile a little and find some comfort and strength each time I read about another wonderful "golden" family or something new. I can't remember how I found your site but I am glad I did. I have shared it with others and recently passed it on to the president of a Golden Retriever Rescue in south Florida. I wish I could give more financial support , and someday I hope to be able to give more, but right now funds are quite limited especially since I decided to adopt my foster (before her medical care has been completed). A sweet senior Golden Gal I pulled out of a high kill shelter who was literally not even hours away from being euthanized. She was so very ill and could hardly walk. She has multiple mammary tumors and has not been strong enough to undergo anesthesia and surgery yet. I could not bear to part with her even though I need six dogs like I need a hole in the head. So, I have been working to build her strength and boost her immune system. Realistically, she probably has cancer. Her needle aspirates were inconclusive, but I did not want to wait until she could tolerate surgery to start fighting what may very well be cancer. I will continue to pray all turns out well. Surgery is scheduled three weeks from now. But, why I tell you all this is to thank you for all you do. And, to Thank You for helping me with such wonderful information I found on your site. I have Maggie Mae on several of the supplements listed in your cancer aware section. I am grateful for all the "help" I can get as I am sure sweet Maggie Mae is. I am writing to tell you how much I love your site! It has given me so many tips to help me raise my own Golden better! My Golden is named Oliver, and, yes,	your Ollie inspired me to name my Golden after him. My Oliver is 1-year-old now, but I first started visiting your website a few months before I got him. He is everything to me! I think of him as my child and would do anything for him. I now can see how you were inspired to create a website about Goldens! They truly are wonderful members to have in your family. Keep up the good work! Rochelle, I just wanted to let you know that I received my Golden Healing Power Certificate this morning. Thank you so much, I plan on framing it tomorrow and hanging it up, but you know Rochelle you should be the one getting rewards for you truly have a golden soul and you bring out the best in everyone. The Best Golden Retriever Website Ever! I had to let you know how much your website has touched my life. I recently retired after a 32 year career teaching Special Ed. My husband and I have always had pets. Two years ago, a handsome Golden puppy, Rudy, entered our lives. Searching for all the info I could on Goldens led me to your site. You are totally awesome! You've opened new worlds to explore. Rudy is active in our local animal shelter as a foster dad. When new pups arrive at the shelter, I bring them home to Rudy and he teaches them the socialization skills they will need to get adopted. Anyway, it's always wonderful when former students return to tell me I made a difference in their lives and give me a hug. I just want to send you a hug and let you know what a difference you've made in my life and others you touch with your website. Thank you! Rochelle, I just wanted to send you a positive note. I really enjoy receiving your e-mails and looking at your website. I never cease to be amazed that you run that whole big site all by yourself. You bring a bright Golden ray of sunshine to my e-mail inbox on a regular basis and I just wanted to remind you how much I appreciate that. I know you enlighten more than a few! Ollie would be proud of his mama, and all she gives, especially to Goldens and their lovers! As people like you and I know, there are many ways of being rich, it doesn't necessarily have to be with money! I always want to let you know how much I appreciate you. It's my love for these dogs and when I'm sitting here at work and I can take a few minutes to stop and look at these dogs and stories that you send me, it just makes my day. By now, I'm sure you have figured out that I'm a real softy for these guys and gals. I am so grateful that G-d has blessed us by giving them to us. Rochelle, you truly are an incredible person. I realized long ago that life was a series of moments, and that happiness was something that was fleeting like a ray of sunshine or light or a feather gently floating by on a wind. Sadly, most of us are so busy meeting the mundane demands of our lives that we miss out on these glimpses or think that happiness is something we can control and sustain for unrealistic periods of time. Our Goldens bring us ongoing moments of happiness in just about everything they do which is why losing them is so hard on us. Thank goodness there are folks like you who are not afraid to express love and sadness and all the other emotions that most people work very hard at running from. This has to be the most incredible website I have ever seen. I was lucky enough to have had a Golden in my life and have friends with Goldens here at work and I've shared your website with them today. We have all cried our eyes out. Your music is so perfect. I started out with Alfie and cried at that!! The pictures are so touching and my heart just melted. We could feel the joy your wonderful Goldens give. They are truly special angels sent here to protect and care for us. I told everyone I'd even like a CD of all your music. I'd envision those gorgeous Goldens every time I listened!! Hi Rochelle. Just wanted to thank you for posting the Rookie tribute. I'm a lurker on g@h but have always enjoyed reading your updates on this special dog and the amazing bond he shares with Carolyn Scott. The tribute had me in tears ... had to shut the office door to watch it! Carolyn and Rookie have been such an inspiration to so many of us in the freestyle community. I took a freestyle seminar with her several years ago and learned so much. Since then, my two Golden boys have gone on to enjoy lots of publicity and freestyle successes, but the most important message I carry with me is one I learned from watching Carolyn early on. It's all about the love; the greater the love, the stronger the bond, and the more inspiring the performance. Carolyn and Rookie will always remain a legend in the freestyle community, and I applaud your efforts to share their special bond with the rest of us! Thank you. We just wanted to tell you how much we appreciate your Blog and all the work you put into it. The stories are fascinating, the photos are wonderful and the spirit of the whole Blog is so positive. The heartwarming stories just brings a feel good feeling, especially on those days that we need it the most. ... We have owned and loved Goldens for over three decades and we still get excited when we see one or talk about them, and of course, if we could we would probably have wall to wall Goldens instead of just Hamish & Sophie. We have told all our friends to bookmark your Blog and enjoy it. Again, thanks!!! I am in the process of doing the research necessary to properly find my Golden Retriever. I found your website and just wanted to tell you that I love it! It is the most heartwarming, comprehensive and informative site I have ever visited. Thank you for all of your meaningful work. I love your site. I don't know what I would have done without it the past several months during my Golden girl's illness. As I'm sure you know, Goldens are the best and she so enriched my life and taught me so much more than I would ever have known without her. I will always cherish her memory. Your site has gotten me through a lot but has really made me cry. But my vet tells me as does my doctor, it's one of the best ways to get through it and it's healthy. Thank you for everything on it. I absolutely LOVE your website. Every time I visit I take in a few more sections or write-ups. You really do have quite a beautiful site. I loved your website. I think that your job is one of the best jobs to have because you love animals and you help out all dogs. I think that that is the best job in the world! Rochelle, I just want to say I too appreciate ALL that you do with your wonderful site and the Gotta Dance raffle. My first Golden girl GINGER LOUISE has been gone for a while and I now have a new one. I named her ROCHELLE LOUISE [after you] & call her SHELLY. She has brought such JOY back to my life. My older German Shepherd has lost 10 pounds from her chasing him around the yard and pool. She is one crazy nutty little 2-year-old. Even though you may not hear from all of us, we ARE Golden Fans of yours. I have enjoyed the Land of PureGold website several times since the passing of my beloved golden, Woods. It's been nearly two years since the loss but I still feel the pain. But, I now enjoy pure gold love once again with my new baby, Chip. I appreciate what you do for the good of Golden Retrievers on your web-site. Every time I look at my adorable Sadie I think of what your web-site has to offer, especially the information regarding cancer in Goldens. Thank you for all you do. Thank you for such relevant care you provide. The 'Cycle of Life' has been of great help to us. Our Golden Angel, Bill, who provided 10.5 years of bliss passed recently, yet his strong spirit remaining has infused us with a quest to gain greater understanding of his life needs, enabling ourselves to embark on more journeys ahead with love and knowledge. What a wonderful mission you have undertaken! And, I am thoroughly impressed with the incredibly helpful information at your website. You have done an amazing and incredible job putting together your website. I am very grateful that I found it and am sharing it with every dog owner I know. As a Golden lover, I am doing all that I can to help my dog stay healthy. My neighbor's Golden died last week from cancer (at age 15), my sister's Golden died last year from cancer (age 10) and her neighbor across the street lost 2 Goldens to cancer. So I want to do what I can to help these wonderful animals to live a long, healthy life. October 11, 2005 we lost our Golden Retired Narcotic officer to Lymphoma. Your site brings some smiles and warmth to us. Thanks for all you do. Being raised on a farm in Iowa, I had an array of pets. Never in my life was there one like my Golden. Thank you for all the information your website contains. It has been a valuable resource to me most recently helping me cope with the loss of my 14 year old beloved Golden named Maggie. She died the day after Darcy and I have watched the beautiful tribute to Darcy over and over again as it reminds me so much of Maggie. Please accept my sincerest sympathy and thank you for sharing her life story in words and pictures. We have been going to your website for over a year and feel that we have barely scratched the surface. Please keep doing what you are doing. It is such a wonderful site, and we are sure it brings much joy and information to many even if they fail to let you know. It is one of the most comprehensive and wonderful websites that we have ever found, and it just so happens to be about the thing we love most in the world next to our family. 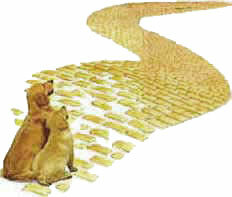 I have just finished reading your story, Following the Golden Brick Road. It had me in tears and in laughter, often both at the same time. You have touched my heart in so many ways, and I thoroughly enjoyed reading each and every one of these pages. It has only reinforced to me, what unique dogs our Goldens are. Thank you for sharing. This is one of the most wonderful sites I have ever come upon. I sat at my computer late into the night crying for my beautiful Chance who went to the Bridge way before I was ready to be without him. As I cried and my eyes went to my three wonderful Goldens all curled up at my feet, I realized what a blessing they are to my life. Thank you so much for this WONDERFUL site. I will visit often! I spend many lunch hours on your Land of PureGold site. It is so comprehensive and intuitive. Many sections help a person to learn while many make you laugh or cry. It is very comforting to me to be at such a wonderful website where so many people sing their praises of the Golden Retriever. Your site is a wonderful testimony to the 'power of gold'. Thank you for what you do, Rochelle, to showcase this extraordinary breed and promote the human-animal bond. Thank you for your dedication to Golden Retrievers and your commitment to education. Your site is amazing and makes us cry every time we go there. I frequently visit your site and every time I do it touches my heart. I have two Goldens and one Lab and they are like my children. It is truly unconditional love that they give. I had another Golden named Alex who died of cancer. Even though he is gone now, he will forever be in my heart. I truly do believe in the bond between humans and animals. I wish everyone had the opportunity to experience that. The site has carried me through the hardest time in my life so far. It helps more than you can possibly imagine. Your website makes me feel good and validates all the reasons I love Goldens and miss Koda. I feel like part of a Golden family. There are many nameless people and people that have not voiced their gratitude that have been helped, uplifted, and educated by your site. Just wanted to tell you that this is the most AWESOME website I have ever seen! I just lost my beloved Bailey, last Thursday, to cancer. I have looked on and off at your site for three straight days, laughing and crying, (more crying). I want you to know how special your site has been to me, especially the part on losing a Golden. I am so scared to get another Golden. Again, thank you so much for the massive amounts of work you must do to maintain such a HUGE amount of information for the people, and the dogs that own them. I wanted to thank you for all the wonderful things you have done for Goldens! I have been viewing your website for the last two or three years, and have found that whenever I need inspiration or a laugh I can find it there. I've always wanted to enter one of your contests, but until you have one to find the best couch potato, roll on your back/paws in the air, truck riding, rabbit chasing, paper shredding, mud-puddle hopping dog - I'll just have to wait. Your site has been comforting to Diane and I all day today. Diane and I have talked a lot, and were comforted by your site. We may stay up all night reading, printing, learning and listening, and talking to each other. I look forward to reading all you have to say. I have been emotionally touched and allot of times teary, with the true love of the Golden. I love your stories, pictures and personal experiences. It makes me feel like you are talking to us ... Murphy and me. Keep up the good work. So many people are blessed because of it. I have never spent so much time on my computer as I have since I found your website. There are just so many amazing stories, cards, Golden everything ... and I have enjoyed it so much. I have given your site information to several of my Golden friends and I know that they will really appreciate it as well. I had no idea that all of this great stuff was available on my computer and to know that there are so many 'Golden Obsessed' people out there. I am always being teased in a friendly way, about always looking for anything that is Golden. Some people just don't get it, but, fortunately I have a lot of friends who understand and feel the same way. We are the fortunate ones! Your videos are great. My big guy Tanner is laying on my lap and he watched the Video of your kids doing tricks, he gave Darcy a lick! Our other Golden boy Rowdy wasn't as interested. They've had a long day of Frisbee catching and they're tired now. I love your site, keep it coming! You are the Golden Angel on so many different levels because of your great website, just for starters. But where the rescue effort is concerned, you did the best thing ever. I just know so many people donated after reading your plea. And even if they could not donate, they forwarded it to someone who they thought might donate. This is what happened with me. There are good people who are happy to help and because of you, they had the chance. I love it all, and I mean it! I couldn't go a day without my Golden Fix, and I am only 13. Sara in Glasgow, KY This site is wonderful. It has helped me in the loss of my Golden Rufus, who has been in my husband's life for 18 years, and in my life for seven years. I just love the sensitivity and genuine love of Goldens that you share. The advice, products, healthy snacks and just about everything I read is fantastic and so Golden! Thanks for sharing your Golden love with all of us! I absolutely LOVE this website! You have done SUCH an awesome job. I come here almost everyday. I have 1 Golden right now. She is 4-years-old and her name is Abby. The part about 'letting go' on your website touched me and brought tears to my eyes. I can not even THINK about not having my Golden with me. It gave me a lot of what my I needed right now. I feel like I have a hole in my heart after losing my most precious Jessica last week to cancer at not quite eight. She was my constant companion, my business mascot, my best friend. When I entered Saying Goodbye, I was simply reduced to a puddle of sobs. The song reached into my soul. The cry was healing, but I'm not sure I'll ever be the same. Thank you for being there. This site has helped me cope with the recent, sudden loss of my first dog, 3½-year-old Golden Buddy. On February 21, 2004, Buddy passed away at home after being diagnosed with kidney failure just two weeks prior. I was in shock. I could not come to grips with how fast this happened. I was depressed and was searching the net for ways to help me get through this and I found your site. Your site it beautiful. I cried reading the stories and looking at pictures. I have learned that Goldens are truly angels and my Buddy was one of them. The best part of the site is the sharing of stories about the dogs. They are wonderful loving animals that deserve the best. We had gotten this Golden by accident. We were the fourth home in one year. Her birthday is December 25th. We got her just before her first birthday and I can't tell you how wonderful she is. She always thought her name was bad girl. She always put her tail between her legs and thought she was going to be punished. When I see other Goldens on this site, I look into my little girl's eyes and see she is so happy and healthy. She loves us unconditionally. The site is one stop shopping for my Golden 'fix for the day'. I'm hooked! Several years ago, I came up with the idea to develop a website about my Golden Retriever, Elwood. I contacted Rochelle as her website, The Land Of PureGold, was the most extensive site that I had come across. After I got Elwood's site up and running, Rochelle was generous enough to put a link to it on the Land Of PureGold. Since that time, I entered Elwood in some of the many contests that Rochelle is constantly putting together. Her efforts to bring Golden lovers together to share their stories and experiences has been unmatched by anyone else. Rochelle's hard work at the Land Of PureGold has brought recognition to many wonderful Goldens and their accomplishments. My only regret about the site is that I don't have enough time to keep up with all that is happening there. It is undoubtedly the best Golden site in the world. The site is all sooooo good. There is NO best part. PureGold is just that ... informative, insightful, and creative. Between the uplifting stories and messages and the wonderful choice of music, I was moved to giggles and tears. For animal lovers (especially Goldens) this site is a joy. The best part is the positive message it conveys. Right now I'm sitting here with my dog laying beside me. I just love this page, I've visited it a thousand times, but I can't get enough of all the dogs, and all the love. I am a sixteen-year-old girl from Norway, I don't have a Golden, but a Tibetan Spaniel. But a dog is a dog, they are all cute, and all something to give our live a little more spirit and love. I think all dog owners out there know what I mean, when I say that nothing can replace a dog, no matter what. The site is good therapy for those of us that have a Golden struck with cancer. Thank you for providing us the information on this site. When I found out our Nick had lymphosarcoma just a couple of weeks ago, I did a search and your site came up which I found invaluable as therapy for us. Thank you. The best part of the Land of PureGold is the exceptional volume of information to be found on Goldens, which extends to all breeds too; the ability to interact and participate with post cards and essays, etc., and most importantly finding friends through this web site! I visit your site often and I really appreciate you getting back to me. You have so much great information on your site and I use it as a resource often! I think it can apply to all dog owners. What I like about this site is that it teaches me to understand how to take care of such sweet and cuddly Golden Retriever of mine named Scooter. It is the most touching and engrossing website on Goldens I have seen! I am a Paramedic at work and browsing Golden sites on the internet to remind me of my babies. I miss them when I am away and this site is a nice way to stay connected, even though it is through others' Goldens. I got my dog when I was one and I am now 12. She was a loyal and faithful girl. I know there is not a dog out there as good as she was. My Golden Retriever died last night and this site knows exactly how special she was to me. I loved her. Thank you. The site is beautiful. I've never seen so much stuff on one dog before, and I love the music. The information, the photos, and everything else just draws me to this site all of the time. I am already dreading the time when I have to say goodbye to my Golden, and she's only 6-months-old! It touches my heart and brings a tear to my eye to read about Goldens, they are such wonderful dogs. I lost my almost 13-year-old Carmal Corn in May 2002 to cancer. I miss her very much and this site brings back the beautiful memories. Thank you sharing the wonderful story of the Golden. I love this beautiful website which brings me great joy and pleasure. I lost my old dog Jason and he could never be replaced. When I visit this site I feel my Jason is still here and see him in every other Golden Retriever I come across. Thanks for all the hard work. This website is really perfect. I learn everything about Goldens from here. I know this site for two and one-half years. When I saw this site, I decided to have a Golden. Thanks for the Land of PureGold. In a few short hours we are going to send our beautiful 9-year-old, terminally ill Golden onto a more peaceful place. Your page on 'Having to Say Goodbye' brought me great peace and has given me the courage to end his suffering with dignity. It will not be easy to say goodbye but it will be our last act of love for this magnificent friend who has brought us endless happiness. We will be there to comfort him and embrace him with our love as he passes peacefully from this world. This site is invaluable to me because I am so far away from other Golden families. Training tips, stories, pictures ... everything. I can't imagine all the love and work that goes into this page. Bravo and thanks! I pass on the address every time I meet a new Golden! What a magical, wonderful website. It helped to feed my Golden obsession. It was difficult to decide what to check out first. It is all so beautifully done and I love the music. Keep up the great work! We love Rochelle's dedication, always being there for us. We are a happy Golden Family all over the world. Rochelle is truly a Golden person in heart and soul. This has to be the best website for Goldies. I have recently lost my Golden. He was seventeen-years-old. Visiting this web site has helped in the healing process. Reading other stories and looking at pictures has really helped. Thank you for having this website. It really has helped. Every time I visit your site, Rochelle, I am amazed at what you come up with next! You are one lovely person with a Golden heart of your own. Thank you so very much to be able to share your love of Goldens, and especially the Golden E-cards. What a smart, talented lady you are. The music, the dogs & puppies, the information ... on and on. Your work and help brings tears to my eyes. Last year, I submitted two stories about my Golden Retriever under your 'Comedians' page. You published them, and I cherish that. They were so funny, even when I reflect on them now. Your website and everyone's Goldens are awesome. Keep it up. This is truly one amazing Golden site, without a doubt, the very best one on the internet. If you just dig there is so much information. Feeding, training, trick tips, etc., the list goes on. I have pulled so much out of this site and put it to practical use with my cherished boy! I love this website because you never find boredom. The story about Ollie dying was very touching. It made me so sad I started crying. Every time I have time to go on the internet I come to this site first. Since I like Goldens this website is my favorite. The gold is certainly this site. I am getting a Golden Retriever for my 8-year-old hearing impaired grandson for Christmas. I stumbled upon this site in an effort to learn more about these dogs and how to train them. THANK YOU for this wonderful, educational, and inspirational site. I have already sent the URL to my daughter. This is just a wonderful site for any Golden lovers, and also being able to see so many other devoted owners and their Goldens just warms the heart so much. There is so much information and topics that you cannot find anywhere else on the web. Keep up your mission Rochelle, you bring so much joy and love to us all. I just wanted to let you know how much I appreciate your wonderful website, as well as your posts directing us to informative articles and Golden related material. Please continue all your good work! Thanks! I was sitting here after a day's work and school and I was looking for something happy to fill my thoughts before I retired to bed. I used to have a Golden fluffy friend myself until he got tragically sick and had to be put to sleep. Anyways I was looking for something nice and so I typed 'Golden Retrievers' on the search engine. I clicked on this site not knowing what would come up. Then, for some reason that picture with that beautiful dog and beautiful woman made me feel so happy! Now I may retire and will have sweet dreams. Good night! This is a very special website. This site emanates hard work, artistic talent, and a true love for the human-dog bond. The information is good and the stories are touching. It's beautiful. The site is a Golden FairyLand. This is the greatest Golden site on the web! I love the way the true heart of the Golden is celebrated on every page. Just wanted to say THANKS for the website. Today I lost my middle Goldie who was 11, she had cancer. I love reading about other Goldies and seeing their pictures. I've got a 4-month-old puppy dog snoring, upside down spread eagle on the rug, and a grandma sawing some wood as well. Sorry, if this note seems a tad strange. I'm tired and brokenhearted. But, I just wanted to let you know that on a very bad day, I got a few big smiles visiting. WOW! What a great site. It truly reflects the Goldens spirit of fun and games. This is the best Golden web site I have seen to date. Your hard work in producing such a site truly reflects your love for the breed. Congratulations on a great website. It is a MUST see for all Golden enthusiasts. One of our 'loopers' said to click on your site. It made my day brighter, I shall forward the information to everyone I know, and personally use the site many times. Thank you! Thank you for sharing. You write like a dream and always have, but this time Ollie made your words turn to pure magic. I didn't blink my eyes once while reading [Ollie's tribute] except to blink away the tears. And the tears flowed even more when you mentioned Mekenzie and when she was tiny and learned how to give Ollie his signals. I remember it well. Your mention of that made my heart sing in that you too knew how much Ollie meant to her. She will still cry when he is mentioned. That was one of the most touching stories [about Ollie's life] I have ever read. With each sentence came a tear knowing your pain and sorrow that came from your heart. I commend you for writing such a wonderful story of Ollie. I'm sure as Ollie looks down upon you with his Golden smile - he is saying great job mom. Truer words could never have been written and you have done it so well. I wish one day we could meet. I have met many Golden owners / breeders and trainers, but what just came from your heart. I have never heard or felt from anyone. I know Darcy must be so heartbroken without her companion. It's too hard for me right now to comment on everything you have written for the tears continue. Your loving Ollie will always be with you, and if there truly is a doggie heaven, he will watch his loving family for eternity. In the meantime, hug and love Darcy with everything you have, for she needs you so very much right now. Many thanks for sharing my e-mail regarding sibling rivalry. After introducing the new Golden pup into the pack, I have received many wonderful responses, and one result is that Ginger is enrolled in obedience training classes. I feel so much better about our situation after reading these e-mails, which contain some very helpful suggestions. Thank you for all you do to help your readers! Rochelle, thank you so much for your wonderful web pages. Since I first got my Golden three years ago you have been a wonderful source of information and sometimes a good cry or just plain fun. I am the Principal of a Special Ed School for severely emotionally disturbed students grades K-12 in Perris, California. My baby Cody has been coming to work with me since he was eight-weeks-old. This past year he finally became a certified Therapy Dog through the Love On A Leash Foundation. Rochelle, you probably don't have time for private e-mails, but I have to thank you for all you do. BUT, you need to send a box of Puffs with each mailing! The story of the young boy and his dog collecting funds brought tears to my eyes, once again. How special YOU are to take the time to put all this together! I love visiting your site and I very rarely leave with dry eyes. I do not mind the tears though, because although some of the stories may make me feel sad in one sense, I also go away with warmth in my heart that I know is due to the love of, and from, this wonderful breed. I really should buy some stock in Kleenex! We appreciate your efforts, your advocacy and love for the Goldens and the joy your communications bring (and sometimes sadness, but isn't that the way life is?). We are out here with our Goldens and knowing there are others who know/appreciate and live by the love of Goldens makes our short lives a little more wondrous. We salute you and give you some joyous 'woofs'. I really, really enjoy and appreciate all that you do. Thank you. I receive your emails at my work so I am not able to do a lot of writing back. I love them and do look forward to all of the information you give us. I have a beautiful 4½-year-old male Golden. He is darn near my entire life. I love him so much! He is the best doggie. No trouble at all, and very obedient. I am thinking all Goldens are probably as awesome? Thanks again! I usually just lurk, but I thought I'd tell you how much your site is appreciated. Many times when I sit at work, it gives me such a lift to go to your site. Therapy for people, too! My Gillette is the love of my life. I was a puppy raiser for Guide Dogs for the Blind. Last May, Gillette went off to school. After three months they dropped him from the program and I had the first chance to adopt him. Couldn't pass that up. Now he's my Gilly Bird, silly dog. Anyway, thanks for all your hard work and dedication. I work with Middle Tennessee Golden Retriever Rescue and foster many of the abused and/or neglected Goldens. I appreciate the Land of PureGold website which I share with other members and friends in need of inspiration. I love to read the stories and often find strength in what other 'Golden People' have to say. Keep up the good work! I just love your site. If I feel down I go to it and get up right away. It's better then therapy. I have had Goldens for 40 years and I can't imagine a house without one or two or three. I have bred them in the past but hated to give them up. Keep up the good work and thanks for this site. Your choice — turn off music or keep on.